READING Residents are encouraged to get their running shoes on this Saturday for a free, timed 5km run in Prospect Park, which is now a weekly fixture in the Reading calendar. Prospect parkrun, which started earlier this month and is being championed by Reading Council, brings free weekly, timed runs at Prospect Park every Saturday, starting at 9am. It is coordinated entirely by volunteers from the local community. This Saturday (2nd June), to celebrate and formally launch the new initiative, the Mayor of Reading, Cllr Debs Edwards and Cllr Sarah Hacker, Reading’s Lead Member for Recreation, will be attending Prospect parkrun at 9am. The event is open to everyone, is completely free and is easy to take part in, although participants need to register in advance at www.parkrun.org.uk/register and bring a printed copy of the barcode it provides. 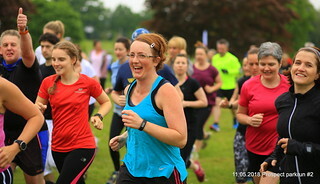 People are encouraged to participate by walking, jogging, running, cheering people on or volunteering, and to catch up for refreshments in a local cafe afterwards. More than 200 runners attended the event the previous week, with the help of 15 volunteers. Prospect parkrun’s Event Director, AJ Jain, said: “Parkrun is a friendly, welcoming event that provides a perfect opportunity to get out in the fresh air to socialise and be physically active in a supportive environment. Photo opportunity: The media are invited to take a photo of the Mayor of Reading, Cllr Debs Edwards and Cllr Sarah Hacker at the parkrun on Saturday 2nd June at 8.50am for a 9am start. The Council has supported this parkrun by granting permission to use Prospect Park, providing storage space for the course set-up equipment and by providing an automated external defibrillator (AED) and training on its use for parkrun volunteers.